WHAT IF YOU COULD BECOME WORLD-CLASS IN ANYTHING IN 6 MONTHS OR LESS? 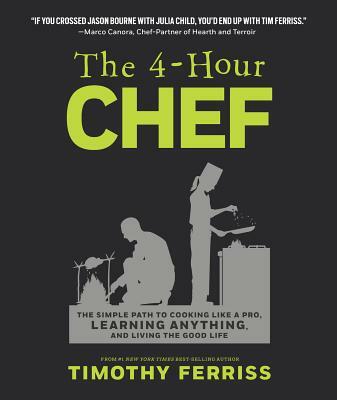 The 4-Hour Chef isn’t just a cookbook. It’s a choose-your-own-adventure guide to the world of rapid learning. #1 New York Times bestselling author (and lifelong non-cook) Tim Ferriss takes you from Manhattan to Okinawa, and from Silicon Valley to Calcutta, unearthing the secrets of the world’s fastest learners and greatest chefs. Ferriss uses cooking to explain “meta-learning,” a step-by-step process that can be used to master anything, whether searing steak or shooting 3-pointers in basketball. That is the real “recipe” of The 4-Hour Chef. You'll train inside the kitchen for everything outside the kitchen. Featuring tips and tricks from chess prodigies, world-renowned chefs, pro athletes, master sommeliers, super models, and everyone in between, this “cookbook for people who don’t buy cookbooks” is a guide to mastering cooking and life. 1. META-LEARNING. Before you learn to cook, you must learn to learn. META charts the path to doubling your learning potential. 2. THE DOMESTIC. DOM is where you learn the building blocks of cooking. These are the ABCs (techniques) that can take you from Dr, Seuss to Shakespeare. 3. THE WILD. Becoming a master student requires self-sufficiency in all things. WILD teaches you to hunt, forage, and survive. 4. THE SCIENTIST. SCI is the mad scientist and modernist painter wrapped into one. This is where you rediscover whimsy and wonder. 5. THE PROFESSIONAL. Swaraj, a term usually associated with Mahatma Gandhi, can be translated as “self-rule.” In PRO, we’ll look at how the best in the world become the best in the world, and how you can chart your own path far beyond this book. TIM FERRISS has been called “a cross between Jack Welch and a Buddhist monk” by The New York Times. He is one of Fast Company’s “Most Innovative Business People” and an early-stage tech investor/advisor in Uber, Facebook, Twitter, Shopify, Duolingo, Alibaba, and 50+ other companies. He is also the author of four #1 New York Times and Wall Street Journal bestsellers: The 4-Hour Workweek, The 4-Hour Body, The 4-Hour Chef, and Tools of Titans. The Observer and other media have named him “the Oprah of audio” due to the influence of his podcast, The Tim Ferriss Show, which has exceeded 200 million downloads and been selected for “Best of iTunes” three years running.